The visiting Indian Prime Minister Atal Bihari Vajpayee's determination to enhance a healthy relationship with China is yet another reason for optimism on the part of both countries over bilateral ties. 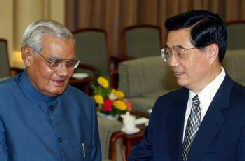 Vajpayee said yesterday when meeting Chinese President Hu Jintao that his visit is intended to express India's willingness to establish co-operative relations with China on the basis of mutual understanding and trust. During yesterday's separate meetings with President Hu, Chairman of China's Central Military Commission Jiang Zemin, top legislator Wu Bangguo and Vice-President Zeng Qinghong, Vajpayee expressed his confidence over the future of bilateral ties. He also emphasized the need for the two nations to strengthen mutual understanding and achieve common development. Hu told Vajpayee that the purpose of China's foreign policy is to maintain world peace and promote common development, adding that China has not, and will never threaten any other country. China is willing to work with the international community, including India, to contribute to world peace and stability. Jiang said bilateral ties have been restored and developed through the concerted efforts of both sides. Adding that long-term, stable and healthy state-to-state ties are in the fundamental interests of the two nations and the two peoples. This is also conducive to peace, stability and progress in the region and the world at large, Jiang said. He went on to add that he hopes the two sides will continue to settle existing issues by the medium of consultation based on an equal footing, mutual understanding and accommodation. For his part, Wu appraised Vajpayee's visit, saying it has opened a new page in bilateral relations. The exchanges between their respective parliaments play an important role in these relations, said Wu, adding that China's National People's Congress hopes to increase co-operation with the Indian parliament. On contacts between political parties, Zeng said that the Communist Party of China, which maintains contact with more than 400 parties in 140 countries and regions, is willing to work with the Indian People's Party to serve the interests of the two countries and their peoples. Vajpayee's visit to China, which is the first by an Indian prime minister in a decade, has attracted wide attention. At yesterday's regular briefing of Chinese Foreign Ministry, spokesman Kong Quan said the development of mutually beneficial relations conforms to the promotion of co-operation and stability in the Asia-Pacific region.